｢불정최승다라니경｣은 당조(唐朝)의 三藏 地婆訶羅(613～687)가 한역(漢譯)한 불경으로 이 다라니경(陁羅尼經)을 매일 독송(讀誦)하면 온갖 고난이 사라지고 공덕을 얻게 되며 나아가 청정한 佛國土에 태어나 열반(涅槃)에 이르게 된다는 내용이다. 조사본 ｢불정최승다라니경｣은 宋朝의 開寶板大藏經을 底本으로 하여 12세기 무렵에 간행된 초조대장경본으로 추정되며, 함차(函次)는 ‘良’이고 판수(板數)는 도합 11板이다. 권두(卷頭)에 永淳 元(682)年 5月 23日에 沙門 彦悰(?～? )이 지은 서문(序文)이 있고 제2장의 제18행에 ‘불정최승다라니경’의 經名과 ‘中天竺三藏地婆訶羅譯’의 역자사항(譯者事項)에 이어 經文이 계속되고 있다. 권말(卷末)에는 地婆訶羅가 한역한 ｢大輪金剛陀羅尼｣와 ｢日光菩薩呪｣가 부재(附載)되어 있으며, 장차(張次)는 ‘최승다라니경’의 판수제(板首題) 아래에 ‘○丈’(2), ‘第○丈’(3·8·9), ‘第○張’(4·5·6·7·10·11) 등으로 표시되어 있다. 권말단(卷末端)에는 면지(面紙)를 연미(燕尾)모양으로 절단하고 양단(兩端)에 주칠(朱漆)의 죽축(竹軸)을 붙였으나 紐는 없다. 본서는 초조대장경(初雕大藏經)으로 현재 전하는 것이 없는 유일본이다. 또한 초조대장경(初雕大藏經)의 다양한 장차표시(張次表示)의 형식을 확인할 수 있는 자료로서 불교학(佛敎學) 및 서지학(書誌學) 연구를 위한 사료로서 중요한 가치를 지니고 있다. The Sutra of the Supreme Sacrosanct Dharani (or Usnisa Vijaya Dharani Sutra) was translated into Chinese by the Tang Tripitaka master Divakara (613-687). According to the text, one needs to recite the sutra in order to be relieved of all difficulties in life, to achieve virtue, and to attain nirvana by being reborn in the pure land of Buddha. This edition of the dharani is conjectured to belong to the first edition of the Tripitaka Koreana published in the twelfth century on the basis of the Kaibao Tripitaka of the Song Dynasty. 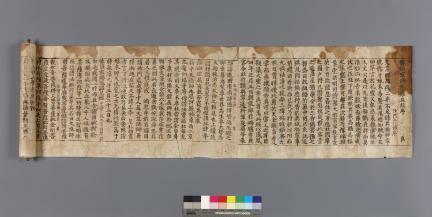 The dharani is known to be the only extant example printed from the first Tripitaka Koreana woodblocks, and contains various devices – including book and page numbers – for the systematic management of the printed Tripitaka materials.